Is Barbra Streisand heading to number one? What is going on in Diana Vickers new single? Because no-one else has inexplicably Photoshopped a Toucan into the artwork. I think it's a big improvement, don't you? 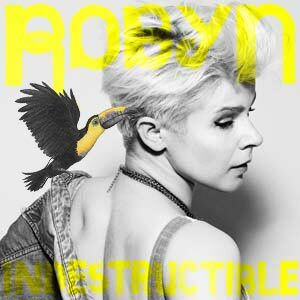 Anyway, Indestructible is going to be Robyn's third single of the year, from her third album of the year. A collosal, footstomping declaration of love, this has already appeared in orchestral form on Body Talk Pt 2. Similarly, Robyn teased fans with an acoustic version of her last single, Hang With Me, on Body Talk Pt 1. As a marketing gimmick, it's inspired. Why has no-one thought of it before? The reswizzled version of Indestructible is out on 22nd November, but the Swedish songstress has handily posted the track, and its various remixes, on her Soundcloud account. Hooray for social media. Now, it might just be me - but do parts of this song (specifically the descending semitone steps when Robyn sings "not alone, no we're not alone") bear an uncanny resemblance to the "lying here, wishing here, wishing here, waiting" melody in Belinda Carlisle's long-forgotten single Lay Down Your Arms?